We are suspending our overnight Family Camp program this summer as we evaluate our new location. Families are invited to participate together in our work day, schedule TBA. 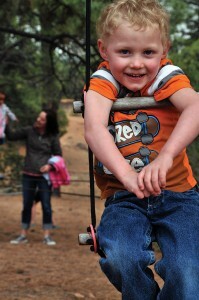 Do you have young kids who can’t wait to grow up to attend Mountain Friends Camp? Would you like to spend three nights in a rustic nature camp with your family this summer, making memories and bonding through play, work, Quaker worship, art, and creating community with other families? Welcome to Mountain Friends Family Camp! This is specially for families with children 12 and under, but let us know if you would like to talk about bringing and older child or teen. We welcome young kids, grandparents, extended, adopted, single and LGBTQ families. Children under 4 are free, and we don’t have a younger or older age limit, but families with members who are very young, elderly, or who have limited mobility will want to discuss carefully and are encouraged to ask plenty of questions before signing up. 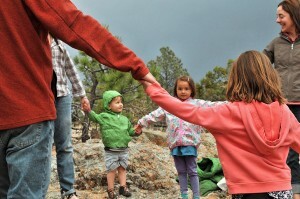 Mountain Friends Camp is a chance for your family to enjoy simple, joyful, community living that is grounded in nature and in experiencing Quaker values. The facility is simple and rustic, with steps or a short ladder to enter cabins, only limited electricity, and running water is about a 10 minute walk to the bathhouse. Each cabin sleeps 5-8 people, so if your family is small we might ask you to share. Or better yet, bring another family to bunk with you! 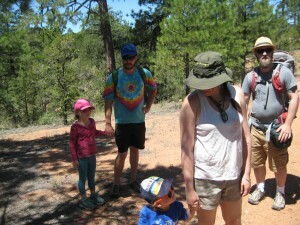 The trails at camp are often rough and uneven, and we get to spend almost all day outdoors. Read more about the locati on. We make our own fun and entertainment at camp and unplug from our phones and other devices. Everyone helps with dishes and cleaning, and we take turns helping cook or with other plork (play+work) projects. There will be lots of fun activities like hiking, creating art projects, story telling, music making, skits and cooperative games, Quaker worship, and time to relax and simply enjoy the beautiful surroundings and our camp community. If this sounds like fun for your family, you can enroll online or contact us with questions.